Our obligations to you may vary depending upon whether you book with us a package, a Flight Plus (as defined below) or a single component arrangement, and our differing obligations are set out below, in four separate sections: Section A contains the conditions which will apply to all bookings. Section B contains the conditions which will apply when you book package. Section C contains those which will apply where you book non package arrangements. Section D contains those terms which will apply where you book a ‘Flight-Plus’. A Flight-Plus exists where you request to book a flight out of the UK, or a flight into the UK where you departed from the UK by another means and on the same day, the day before or the day after, you also request to book either living accommodation or self-drive car hire which takes place outside the UK and is supplied under or in connection with your flight. In all cases the sevices must cover a period of more than twenty four hours or include overnight living accommodation in order to make them a Flight-Plus. If in connection with the flight, you may also book any other tourist services which are not ancillary to flight or living accommodation and which account for a significant proportion of the Flight-Plus, they will also form part of the Flight-Plus. Where you request to book as Flight-Plus, we will be a Flight-Plus Arranger in accordance with the definitions set out in Regulation 25 of The Civil Aviation (Air Travel Organisers’ Licensing) Regulations 2012. Please note, in respect of some package bookings, when making your booking we will arrange for you to enter into a contract with the applicable supplier of the package in question. We then act as agent only. In this case, your booking confirmation will stipulate the particular Tour Operator with whom you will have a contract for the supply of your package holiday. In this event, please note that we accept no liability in relation to any contract you enter into or for any arrangements you purchase or for the acts or omissions of any supplier(s) or other person(s) or party(ies) connected with any arrangements. As agent, we accept no responsibility for the actual provision of the arrangements. Our responsibilities are limited to making the booking in accordance with your instructions. We accept no responsibility for any information about the arrangements that we pass on to you in good faith. For all bookings we make as agent, your contract will be with the supplier of the arrangements in question and the specific booking conditions of the relevant supplier(s) your contract with will apply in place of all conditions below. You are advised to read these conditions carefully prior to the booking. The supplier’s terms and conditions may limit and/or exclude the supplier’s liability to you. Copies of applicable conditions are available on request from us. Any money paid to an authorised agent of ours in respect of a booking covered by our ATOL is held by that agent on behalf of and for the benefit of the Trustees of the Air Travel Trust at all times, but subject to the agent’s obligation to pay it to us for so long as we do not fail financially. If we do fail financially, any money held at that time by the agent or subsequently accepted from the consumer by the agent is and continues to be held by that agent on behalf of and for the benefit of the Trustees of the Air Travel Trust without any obligation to pay that money to us. There are varying types of flights that we may book as part of your package i.e. Charter, No Frills, Full Published and Consolidated. Any flight element of your holiday is provided by an independent supplier. Each supplier has their own terms and conditions. Some of these terms and conditions may limit or exclude the supplier’s liability to you, usually in accordance with applicable International Conventions. Copies of the relevant parts of these terms and conditions are available on request from ourselves or the supplier concerned. A charter flight is invariably where an ATOL licensed Tour Operator such as AVRO, Thomson, or Thomas Cook etc has “chartered” their own Aircraft. When we book a charter flight on your behalf, we will identify that Charter Operator on your ATOL receipt. Full terms and conditions relating to individual charter airlines may be found in the relevant charter airline brochures. Where copies of these conditions are not readily available, copies of these terms and conditions are available on request from ourselves or the supplier concerned. By booking with us, you are agreeing to these conditions. When we book a “No Frills” flight on your behalf, we will identify that “No Frills” Airline on your ATOL receipt. It should be noted, that “No Frills” airlines operate independently of each other and are normally quite inflexible. Furthermore, they will invariably charge more for amendments once the booking has been made and levy “severe” cancellation charges. By allowing or asking us to book a “No Frills” flight on your behalf, we regret and you accept that we are unable to take any responsibility for flights changes, or cancellation made to any part of your reservation by the “No Frills” Airline. For the avoidance of doubt, when we book a “No Frills” flight on your behalf, you are agreeing to the “No Frills” Airline booking terms & conditions. We will of course endeavour to change / amend all other components of your package without charge through co-operation with our suppliers in the event of a cancellation or change by the No Frills Airline however cannot guarantee this will be the case. A “Full Published/Consolidated” Flight is normally identified as a flight operated by a “National Carrier” such as British Airways, KLM, Air New Zealand , Cathay Pacific etc. When we book a “Full Published/Consolidated” flight on your behalf, we will identify that “Full Published/Consolidated” Airline on your ATOL receipt (identified as “BSP” OR “Triton Airfares Consol”). It should be noted Full Published/Consolidated Airlines normally levy “severe” cancellation/amendment charges dependent on the type of ticket booked. Unfortunately, Airlines may occasionally change the type of aircraft on a particular flight without advance warning. Flight timings and days of operation are subject to change and we will advise you of any significant change as soon as we ourselves are informed by the airline. Minor timing changes will be shown on the flight tickets, which you should check carefully when received. It is possible that flight times may be changed even after tickets have been despatched – we will contact you as soon as possible if this occurs. Generally, your accommodation will be available from 2pm on the date of arrival , and is to be vacated between 10 am and noon on the date of departure, irrespective of your arrival or departure times and unless we have stated otherwise. Should you wish your room to be ready prior to this time frame on your day of arrival or available after 10 am for an afternoon or evening departure, it may be possible to reserve the room at the time of booking however this will be on a “subject to availability” basis. This could incur additional cost and is normally paid locally. Should we not be able to accommodate your request, you may also ask at reception (if applicable) on your date of arrival or at any time during your stay. Meals if included, are based on table d’hote menus, or a meal voucher system unless specified otherwise. Holidays which include main meals generally commence with dinner on the day of arrival at your accommodation, terminating with breakfast (on half board) or lunch (on full board) on the day of departure. No refunds on meals “not taken” can be given. Special diets of any kind (including vegetarian) can seldom be catered for adequately within the constraints of a table d’hote menu and cannot be guaranteed. We would therefore strongly suggest that anyone with special requirements takes a holiday where no meals (or only breakfast) is included. Please note, if you book accommodation on an “all-inclusive” basis, accommodations differ in their “all-inclusive” offerings including the time all inclusive options are available. Assumptions should not be made that accommodations booked on this basis will include for example “branded” spirits as they may offer local alternatives. You MUST take out fully comprehensive travel insurance. It will normally cover you in the event of cancellation against loss of deposit or cancellation fees and for medical costs in the event of you becoming ill or having an accident whilst on holiday. There are some restrictions on insurance, for example pre-existing medical conditions and you should advise the insurance provider of these at the time the policy is taken out. It is your responsibility to ensure that the insurance cover you purchase is suitable and adequate for your particular needs. If you choose to travel without adequate insurance cover, we will not be liable for any losses howsoever arising, in respect of which insurance cover you would otherwise have been available. You should take up-to-date health advice about the health precautions you will need to take prior to departure. Information on health is contained in the Department of Health’s leaflet (Health Advice for Travellers) which can be obtained by telephoning 0207 210 4850. Further information can be obtained by visiting www.hpa.org.uk OR www.fco.gov.uk . In these Booking Conditions, “force majeure” means any event which we or the supplier of the service(s) in question could not, even with all due care, foresee or avoid. Such events may include war or threat of war, riot, civil strife, actual or threatened terrorist activity, industrial dispute, natural or nuclear disaster, adverse weather conditions, fire, pandemic and all similar events outside our control. Except where otherwise expressly stated in these booking conditions, we regret we cannot accept liability or pay any compensation where the performance or prompt performance of our obligations under our agreement with you is prevented or affected by, or you otherwise suffer any damage or loss as a result of force majeure. (1) Except as otherwise stated in these conditions or where we act as a booking agent, will accept responsibility for the package arrangements we agree to provide or arrange for you as an “organiser” under the Package Travel, Package Holidays and Package Trours Regulations 1992 as set out below. Subject to these booking conditions, if we or our suppliers negligently perform or arrange the services which we are obliged to provide for you under our contract with you, as set out on your confirmation invoice, we will pay you reasonable compensation. The level of such compensation will be calculated taking in to consideration all relevant factors such as but not limited to: following the complaints procedure as described in these conditions and the extent to which ours or our employees’ or suppliers’ negligence affected the overall enjoyment of your holiday. Please note that it is your responsibility to show that we or our supplier(s) have been negligent if you wish to make a claim against us. ‘force majeure’ as defined in clause 25 above. (6) This clause 26 is intented to set out our obligations to you as an organiser under the Package Travel, Package Holidays and Package Tours Regulations 1992. We will not accept any further or different liability than these Regulations impose. In addition, regardless of any contrary representations made by us, we only promise to use reasonable skill and care as set out above and we do not have any further or different liability to you. Even in the above cases, only if the amount of the increase in our costs exceeds 2% of the total cost of your holiday (excluding insurance premiums and any amendment charges), will we levy a surcharge. If any surcharge is greater than 10% of the cost of your holiday (excluding insurance premiums and any amendment charges), you will be entitled to the options as referred to under “Changes and Cancellation by us”. If a surcharge is payable, there will in addition be an administration fee of £1 per person together with an amount to cover agents commission. Although insurance (where purchased through us) does not form part of your contract with us or of any “package”, we will consider an appropriate refund of any insurance premiums you have paid us if you can show you are unable to use/reuse or transfer your policy in the event of cancellation or purchase of an alternative holiday. You have 14 days from the issue date printed on the surcharge invoice to tell us if you want to choose option (b) or (c) as set out under “Changes and Cancellation by us” below. If you do not tell us that you wish to choose either of these options within this period of time, we are entitled to assume that you do not wish to do so and will pay the surcharge. Any surcharge must be paid with the balance of the cost of the holiday or within 14 days of the issue date printed on the surcharge invoice, whichever is the later. Most changes are minor. Occasionally, we have to make a “significant change”. A significant change is a change made before departure which, taking account of the information you give us at the time of booking and which we can reasonably be expected to know as a tour operator, we can reasonably expect to have a major affect on your holiday. Significant changes are likely to include the following changes when made before departure; a change of accommodation to that of a lower classification or standard for the whole or a major part of the time you are away or a change of accommodation area for the whole or a major part of the time you are away. Please note, where your booking includes a “no frills flight”, changes imposed by the airline (for example, change of departure or return time or UK or overseas airport) and the consequent effect on your holiday will not generally be treated as “significant changes” in accordance with this clause. For all flights, a change of departure or return time by less than 12 hours will be a minor and not significant change. Very rarely, we may be forced by “force majeure ” (see clause 25) to change or terminate your holiday after departure but before the scheduled end of your time away. This is extremely unlikely but if this situation does occur, we regret we will be unable to make any refunds (unless we obtain any refunds from our suppliers), pay you any compensation or meet any costs or expenses you incur as a result. These cancellation charges apply to all bookings, except where a booking includes items or services where our suppliers’ own cancellation charges exceed those shown above. Please enquire at the time of booking as up to 100% cancellation charges may apply from the time of booking. For flights booked under our ATOL we provide this secuity by way of a bond held by the Civil Aviation Authority until ATOL number 3973. Some flights may not be booked under our ATOL (eg where we use your credit card to book a low cost flight on your behalf). Those flights will not be financially protected. The above options will not be available if we make a minor change or cancel as a result of your failure to make full payment on time. We regret we cannot pay any expenses, costs or losses incurred by you as a result of any change or cancellation. Very rarely, we may be forced by “force majeure” (see clause 25) to change or terminate your arrangements after departure. If this situation does occur, we regret we will be unable to make any refunds, pay you compensation or meet any costs or expenses you incur as a result. (1) Except otherwise stated in these conditions or where we act as a booking agent, we have a duty to select the suppliers of your arrangements with reasonable skill and care. Except as stated otherwise in these terms, we have no liability to you or the actual provision of the arrangements, except in cases where it is proved that we have breached that duty and damage to you has been caused. Therefore, providing we have selected the suppliers with reasonable care and skill, we will have no liability to you or anything that happens during the service in question or any acts or omissions of the supplier, its employees or agents. (d) an event which either ourselves or suppliers could not, even with all due care, have forseen or forestalled. i) The extent of our liability will in all cases be limited as if we were carriers under the appropriate Conventions, which include The Warsaw/Montreal Convention (international travel by air); The Athens Convention (with respect to sea travel); The Berne/Cotif Convention (with respect to rail travel) and The Paris Convention (with respect to hotel arrangements). You can ask or copies of these Conventions from our offices. Please contact us. In addition, you agree that the operating carrier or transport company’s own ‘Conditions of Carriage’ will apply to you on that journey. When arranging transportation for you, we rely on the terms and conditions contained within these international conventions and those ‘Conditions of Carriage’. You acknowledge that all of the terms and conditions contained in those ‘Conditions of Carriage’ form part of your contract with us, as well as the transport company and that those ‘Conditions of Carriage’ shall be deemed to be included by reference into this contract. b) If, before your intended departure on a Flight-plus we become aware that any part of your Flight-Plus will not be provided because of the insolvency of any person concerned with the provision of the arrangements making up a Flight-Plus we will provide you with suitable altenative arrangements at no extra cost. If it is impossible to make such arrangements, we will give you a full refund of all monies paid to us in respect of your Flight-Plus. d) If, after your intended departure on a Flight-Plus we become aware that your living accommodation, or self-drive care hire will not be provided because of the insolvency of any person concerned with the provision of the living accommodation or self-drive car hire making up your Flight-Plus, we will provide you with suitable alternative living acccommodation or self-drive car hire at no extra cost. If it is impossible to make such arrangements, we will give you a full refund of all monies paid to us in respect of all unused flight accommodation, living accommodation, self-drive car hire and other tourist services forming part of your Flight-Plus. f) We, or the suppliers of the services you have bought, will provide you with the services you have bought (or a suitable alternative). In some cases, where neither we nor the supplier are able to do so for reasons of insolvency, an alternative ATOL holder may provide you with the services you have bought or a suitable alternative (at no extra cost to you). You agree to accept that in those circumstances the alternative ATOL holder will perform those obligations and you agree to pay any money outstanding to be paid by you under your contract to that alternative ATOL holder. However, you also agree that in some cases it will not be possible to appoint an alternative ATOL holder, in which case you will be entitled to make a claim under the ATOL scheme (or your credit card issuer where applicable). We provide financial security for Flight-Plus bookings by way of a bond held by the Civil Aviation Authoriy under ATOL number 3973. For further information, visit the ATOL website at www.atol.org.uk. The price of our flight inclusive arrangements includes the amount of £2.50 per person as part of the ATOL Protection Contribution (APC) we pay to the CAA. This charge is included in our advertised prices. Not all holiday or travel services offered and sold by us will be protected by the ATOL scheme. 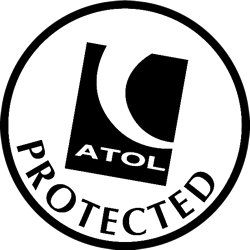 ATOL protection extends primarily to Customers who book and pay in the United Kingdom.